The Trump administration is turning to a tried and true recruiting strategy to fulfill a massive hiring surge ordered by the president: offering more money. 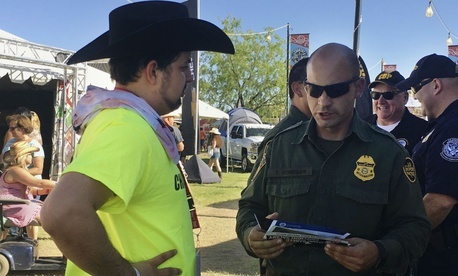 Customs and Border Protection has yet to make a significant dent in Trump’s mandate to hire 5,000 new employees, but it is taking new measures aimed at recruiting employees in areas in which it has struggled to identify new staff. The agency will send national recruiters to Arizona to target candidates there and, pending approval from the Office of Personnel Management, offer higher pay in the state than elsewhere in the nation. Federal statute typically caps recruitment pay at 25 percent of an employee’s base pay, but CBP is seeking special approval to boost that rate to 33 percent. OPM regulations say agencies can offer recruitment incentives to new employees when “the agency has determined that the position is likely to be difficult to fill in the absence of an incentive.” CBP must establish a recruitment plan and justify the need for the incentive prior to offering the higher pay. Agencies can request authority to offer recruitment bonuses of up 50 percent of base pay, with OPM holding final say. The payments can be made as a lump sum at the beginning or end of an employee’s service, in installments throughout their service, or some combination of those options. The payment can be multiplied by up to four years, but cannot exceed one year’s worth of the employee’s annual salary. CBP was unable to comment on how it settled on 33 percent as its incentive figure or if it will expand the approach to other states. Trump demanded the hiring by executive order in January. While the Homeland Security Department’s inspector general recently questioned the need for the staffing surge, current drafts of the fiscal 2018 spending bill would provide CBP with funding to onboard an initial 500 new employees. In April, OPM granted CBP and Immigration and Customs Enforcement, which Trump tasked with bringing on 10,000 new officers, two-year direct hire authority to hire a total of 19,000 employees to fulfill Trump’s mandate and existing shortages. CBP Assistant Commissioner Linda Jacksta, who announced the new recruiting strategies at a stakeholder meeting organized by Sen. Jeff Flake, R-Ariz., said military service members transitioning to civilian jobs will see expedited hiring through exemptions from physical fitness tests and “other basic hiring requirements” already verified by the Defense Department. Flake and others in Congress are also aiming to eliminate the polygraph test requirement for those applicants. Still, the new efforts are likely to be small steps toward fulfilling Trump’s goal. CBP maintains rigorous onboarding procedures and relatively high rates of turnover. As of March, for example, just one in four CBP applicants were able to pass the mandatory polygraph test. CBP is developing strategies and pilot programs to ease the process, but maintains the agency will not compromise its standards to increase speed. Based on current hiring and attrition rates, the DHS IG estimated, CBP would need 750,000 applicants to fill Trump’s order. It is, however, adjusting its polygraph test and reforming its training process. Agency leadership has said the average application processing time has decreased from 400 days in 2014 to 160 days today.